Being part of South Korea’s largest conglomerate has its benefits. The heir apparent to Samsung Group has pledged to backstop troubled Samsung Engineering’s 1.2 trillion won ($1 billion) rights issue. 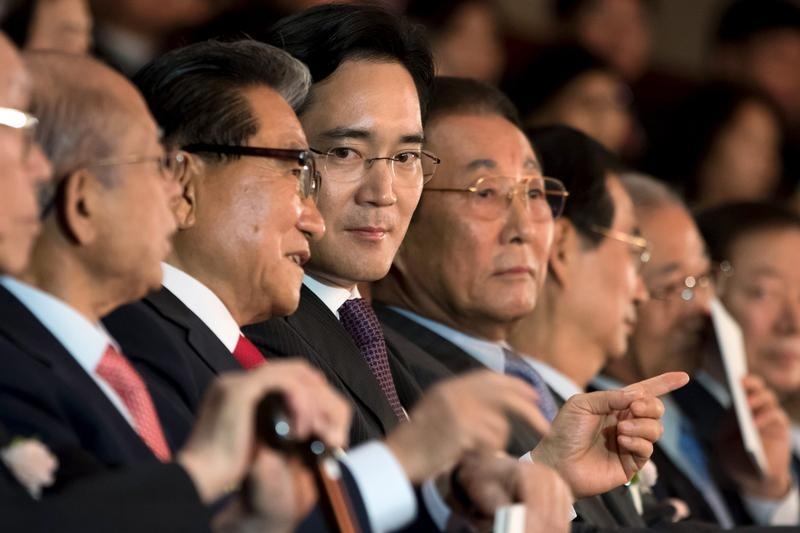 For investors, it’s a reminder that operating under the umbrella of the country’s chaebol is not all bad. The cash call – which is now raising more than twice Samsung Engineering’s market capitalisation – is a financial lifeline. Falling oil prices have hit the construction company particularly hard. New orders for oil and gas plants, which bring in over half its revenue, tumbled 80 percent year on year in the nine months to September. In the third quarter, Samsung Engineering posted a record operating loss of 1.5 trillion won. To fix its balance sheet, Samsung Engineering is issuing 156 million new shares at 7,700 won each – a 45 percent discount to its share price on the day the terms were announced. Part of the cash will come from other group companies including 13 percent shareholder Samsung SDI, a $7 billion display-to-batteries maker. In an attempt to limit the cost of the bailout for these affiliates, Lee has said he will personally chip in up to 300 billion won if existing shareholders don’t take up all their rights. This public show of support is rare, particularly since Lee doesn’t own a direct stake in the troubled company. If the rights issue succeeds, Lee will not have to reach into his own pocket. But the fundraising may still fall apart. Samsung SDI and two other affiliates own roughly 22 percent of the company. Even with Lee’s personal contribution, Samsung Engineering will not be able to raise the full 1.2 trillion won without the support of some existing shareholders. That’s not a foregone conclusion: last year, a $2.5 billion takeover of Samsung Engineering by another Samsung company was scrapped because shareholders from both sides demanded a share buyback worth $1.5 billion – more than those companies were willing to pay. Lee’s intervention is scant consolation for Samsung Engineering shareholders who have seen its shares plummet by 70 percent since the failed merger. Without the help of their big brother, though, they would be even worse off. Jay Y. Lee, the vice chairman of Samsung Electronics, said he would buy up to 300 billion won ($254.7 million) worth of Samsung Engineering shares should the company’s rights issue not be fully subscribed. Samsung Engineering, an affiliate of the South Korean conglomerate, primarily makes oil and gas facilities and plants. The company plans to issue 156 million new shares at 7,700 won per share, it said in a filing on Dec. 7. The 1.2 trillion won rights issue, first announced in October, will be completed by March 2016. Samsung Engineering booked a record quarterly operating loss of 1.5 trillion won in the three months to September. The struggling group is also in the process of selling its headquarters at a book value of 350 billion won. Samsung Engineering said the proceeds of the rights issue and building sale would be used to bolster its financial stability. Samsung SDI is the construction company’s largest shareholder with a 13.1 percent stake. Two other Samsung affiliates further hold a combined 9 percent stake. If Samsung Engineering’s rights issue is undersubscribed, Samsung SDI would have to buy up to 163 billion won worth of shares, estimates Bernstein. Shipbuilder Samsung Heavy Industries last year proposed a $2.5 billion takeover of Samsung Engineering - part of the Samsung Group’s efforts to simplify its ownership structure. But the deal was abandoned in the face of investor demands for a share buyback. Shares of Samsung Engineering closed up 14 percent to 15,900 won in Korea on Dec. 8.